Registered Maine Guide, Levi Ladd offers guided fishing charters in the Katahdin and Moosehead Lake Region. 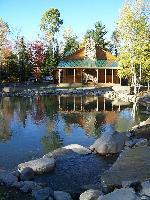 We specialize in fly fishing, ice fishing and trolling on these scenic waters for brook trout, togue and salmon. Gear, lunch, and photo CD included in your charter.